Prove as barracas de comida escondidas da rua lateral e os cafés de dar água na boca da cidade de Ho Chi Minh durante este passeio gastronômico de 4 horas de scooter. Comece sua viagem com alguns passeios, verificando pontos de referência como o Correio Central, Ben Thanh Market e Palácio da Independência, entre outros. Em seguida, navegue pelas ruas secundárias menos conhecidas de Ho Chi Minh City com o seu guia enquanto visita as principais barracas de rua para comer, beber e socializar. Este passeio gastronômico pela cidade de Ho Chi Minh, facilmente personalizável para atender aos seus interesses alimentares e pedidos de itinerário, também inclui um guia, todos os alimentos e bebidas, moto e capacete, transporte de ida e volta do hotel e fotos da viagem. Confira os pontos de referência famosos da cidade, como o Mercado Ben Thanh, a Agência Central dos Correios e o Palácio da Independência. you will go places you never imagined and feel completely safe doing it. If you're a foodie you have to try this tour. The four ladies were brilliant, informative and really friendly. Learnt a lot and my wife said it was more like being shown around by friends than a tour company. Highly recommended! Wonderful way to start our time in Saigon. Our guides Trang and Nikki made as feel safe on the bikes at all times as we wound our way around the chaos that is the motorbike traffic of Saigon. Although not easy to do while driving, both ladies particularly Nikki chatted as we drove, giving some information on Saigon and the areas we were passing through. All of the street food we stopped for along the way was delicious and we were certainly full by the end of the morning! As an added bonus, we also had photos from the day emailed to us after the tour. Tour was great! The tour leader Susan was engaging and wanted me to love her Vietnam! We chose this tour because of the flexibility of timings and small groups. We were met at our chosen place by Trang, Nicky, Nhu and Anh. The girls were fantastic and gave us a great insight into Ho Chi Minh city life. They were knowledgeable and fun, they took us to various sites as well as two local food places where we sampled excellent food with no tourists in site. The traffic is mad and very busy, but the girls drove with great confidence and we all felt really safe. They chatted endlessly along the way and weaved in out of small alleys, through the flower market, and we ended up shopping at the market where the girls waited so they could drop us back to our pick up point. We were visiting for the day whilst on a cruise and we would rate this tour as the best day of the 2 week holiday. Excellent all round thank you girls! Great! 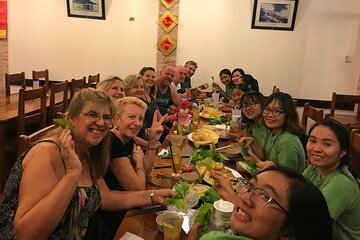 If you want to see real streetlife, taste of local food and experienced vietnamese lifestyle scooter tour is the right way! My guide was fantastic, kind, communicative in english, she did her best to make my wishes come true. The whole trip was perfect! !